Miele Classic C1 Cat & Dog vacuum cleaner. The Miele Classic C1 Cat & Dog is engineered and manufactured in Germany and is designed for pet owners and to clean all surfaces. 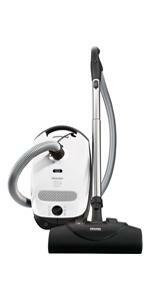 This full size, light weight, quiet and powerful vacuum features a 1200 W motor with 6 step suction control to efficiently pick up pet hair, dust and dirt on any surfaces. The SEB228 Electro+ Electro brush is designed to clean all carpeting types and extract pet hair from your carpeting. The Miele Classic C1 Cat & Dog vacuum cleaner also included is the SBB Parquet Floor Brush which will clean all your hard floors. 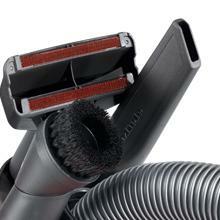 Also included is the STB20 Mini Turbo Brush which will help cleaning carpeted steps and furniture throughout your home. Miele’s Classic C1 Cat & Dog vacuum cleaner features an Electro Plus floorhead with a five-level height adjustment and an independent motor. 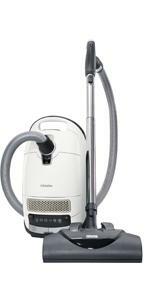 Miele Classic C1 Cat & Dog vacuum cleaner is A perfect choice for larger rooms with medium to deep pile carpeting. The Miele Classic C1 Cat & Dog vacuum cleaner also includes the Parquet Twister - providing 180° rotation for the agile, yet gentle care of smooth surfaces. The Miele Classic C1 Cat & Dog vacuum cleaner has an Active Air Clean Filter with active charcoal layers to neutralize and absorb unwanted pet odors. 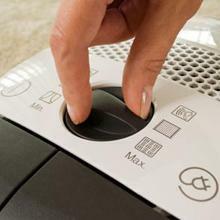 Choose up to six different power settings with suction control via Rotary Dial. In addition to the three standard accessories — a dusting brush, upholstery tool and crevice nozzle — the Miele Classic C1 Cat & Dog features a Handheld Mini Turbo Brush that easily removes pet hair from furnishings. With a five-level height adjustment, the Electro Plus Floorhead is ideal for medium to high-pile carpeting. The Parquet Twister Floorhead rotates 180° - offering exceptionally agile cleaning for all smooth flooring. 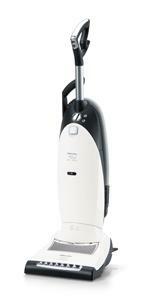 Miele Classic C1 Cat & Dog vacuum cleaner is designed specifically for pet owners. 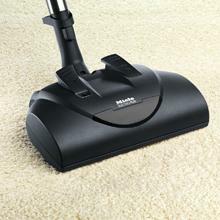 The SEB228 Electro+ Electro brush is designed to clean all carpeting types and extract pet hair from your carpeting. The Miele Classic C1 Cat & Dog vacuum cleaner also included is the SBB Parquet Floor Brush which will clean all your hard floors. 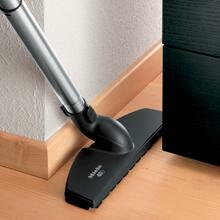 Also included is the STB20 Mini Turbo Brush which will help cleaning carpeted steps and furniture throughout your home. 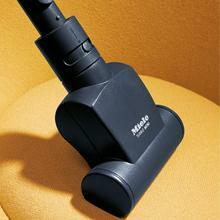 There are three different Miele Cat & Dog vacuum cleaners are available, below are the details. 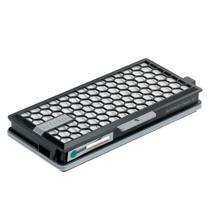 Perfect for pet owners, this filter combines AirClean technology with an active charcoal cassette that neutralizes and absorbs odors.